At Precision Appliance Repair, we have provided appliance repairs to customers in San Diego, CA and the surrounding areas for over 10 Years. Our level of skill and customer service cannot be beaten and it is just one of the many things that set us apart from our competitors. Our service technicians are highly trained and experienced and always use the highest quality parts and products available. Dishwashers – Do you need dishwasher repairs in San Diego CA? Dishwashers are a complex piece of machinery that can be affected by a variety of issues. It is common for a dishwasher to stop filling with water, stop heating, or completely lock up and leak. Other common issues include spotting on your glassware or dirty dishes after a cleaning cycle. At San Antonio Appliance Services, we understand dishwashers and how to repair them even if they are outside the manufacturer warranty. We are available to help take care of your dishwasher repair in San Diego, CA and the surrounding area. Refrigerators – Do you need Refrigerator Repairs in San Diego CA? Damaged seals, leaks, inconsistent temperatures or ice buildup in your refrigerator? 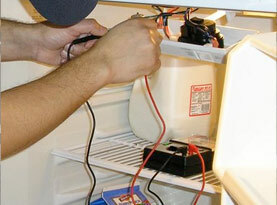 Our factory trained repair technicians can solve your refrigerator repair problems quickly. No matter the size of the problem, in warranty, third party extended warranty or completely out of warranty, our experienced technicians will diagnose your refrigerator repair needs and get your kitchen back up and running in next to no time. Freezers – Do you need freezer repairs in San Diego CA? At Precision Appliance Repair we take freezer repair problems very seriously. If you are like most homeowners you stand to lose a lot of money if your freezer stops working properly, not to mention putting your family at risk. Our factory trained repair technicians will give your freezer repair the top priority it deserves. From leaks to broken or damaged seals – we have you covered; our repair technicians will restore your freezer to factory specifications and provide you with the excellent service you have come to expect from Precision Appliance Repair. Microwave Ovens – Do you need microwave oven repairs in San Diego, CA? One of the most time efficient appliances in your kitchen is the microwave. From reheating, thawing, warming and even cooking, the microwave is a necessity in many American households. If your microwave has stopped heating, won’t turn the food, or has stopped working completely, the experienced repair technicians at Precision Appliance Repair have got you covered and will repair your microwave and get you cooking again quickly. Do you need Range, Stove, Cooktop or Wall Oven Repairs in San Diego, CA? Ranges, stoves, cooktop and wall ovens all require repairs at some point in time. At Precision Appliance Repair we provide fast and affordable repair services for problems including error codes, temperature fluctuations and stoves that won’t ignite to name but a few. Contact the professionals at Precision Appliance Repair today and let our experienced technicians fix your range, stove, cooktop and wall oven issues and get your cooking appliance back in working order as soon as possible. Washing Machine Repair – Do you need Washing Machine Repairs in San Diego, CA? If you are experiencing problems with your washing machine, turn to the qualified repair technicians at Precision Appliance Repair. 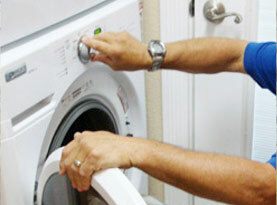 Our technicians are factory trained to take care of your washer repairs. If you are within your factory warranty, have an extended warranty or no warranty at all, you have found the right repair team to give you competent, courteous washer repair service with a smile. Dryer Repair – Do you need Dryer Repairs in San Diego, CA? You can trust the professionals at Precision Appliance Repair to understand your concern when you have a washing machine that is full of wet clothes and your dryer is on the blink. 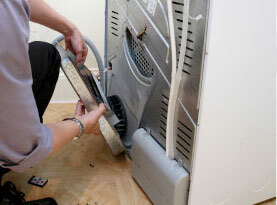 When you need dryer repairs, contact our knowledgeable technicians to solve and repair your dryer issues. Under warranty or out of warranty, we have you covered and our expert service technicians will take care of your dryer repair problems quickly and efficiently to get your laundry fully functional in next to no time! 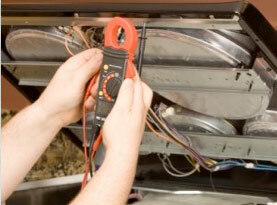 Need Appliance Repair Service in San Diego, CA and the surrounding area? Contact us today and speak with an experienced customer service technician to schedule your appliance repair appointment today!